Perfect for a holiday breakfast or special family brunch, this recipe for cheese puff casserole is a savory dish the whole family will love. 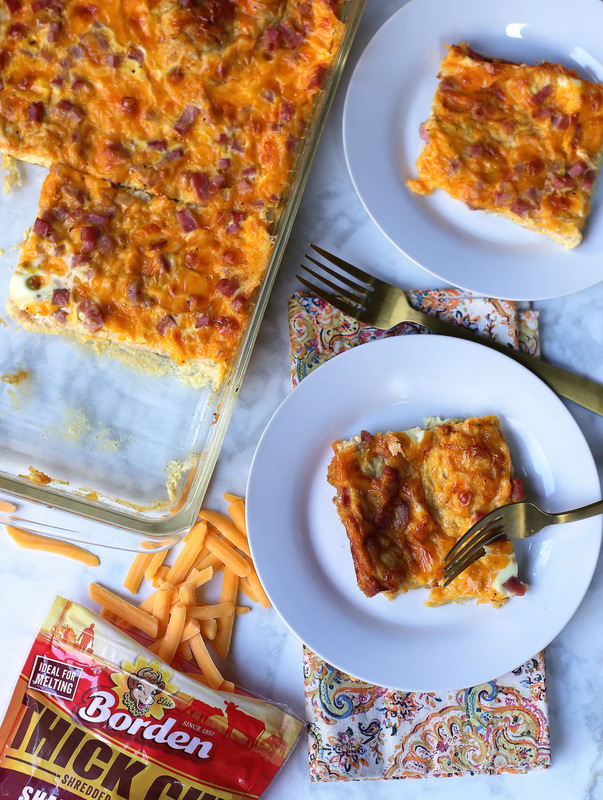 Made with creamy sharp cheddar cheese and diced ham, it’s a recipe you can prep ahead to make breakfast a breeze! Thank you to Borden® Cheese for sponsoring this post. Whether it’s gathering in the kitchen to bake a family recipe or sitting down to a meal together, Borden® Cheese believes memories are made in the kitchen, especially around the holidays and this November they’re teaming up with Southern Living Magazine to give five people $5,000 to use toward upgrading their kitchen. To enter, visit www.SouthernLiving.com/BordenLoveYourKitchen through November 30, 2018! Throughout the nine years I’ve been blogging, I’ve documented the holidays with my family every single year. Longtime blog readers are probably used to seeing familiar dishes pop up on my family’s table every Christmas and Thanksgiving and every year I go into the holiday season with the intention to share some of our favorite holiday recipes with you guys. Some of my favorite holiday memories center around preparing (and eating!) our family’s go-to recipes. I’ve shared a few on the blog — my mom’s stuffing (hands down my favorite Thanksgiving dish and one I desperately need to re-photograph! ), Ryan’s grandmother’s glazed carrots, my mother-in-law’s pineapple soufflé, Mimi’s sugar cookies — but even after nine years, I still have a handful of holiday recipes that haven’t managed to make it on PBF. Well, I’m excited to say that another holiday recipe favorite is coming your way today and this is the recipe I can guarantee you’ll see at my family’s breakfast table every Christmas morning! I’ve mentioned my mom’s cheese puff casserole on the blog for years and it’s the kind of recipe that’s a little challenging to describe. It’s cheesy and savory and tastes a bit like a thin yet fluffy omelet or a savory bread pudding. Oh and there’s no “healthifying” this recipe. Embrace it for what it is — a holiday dish that’s made with butter, bread, whole milk and a whole lot of love! The base of this recipe is bread and we typically opt to make it with white bread or oatmeal bread. We’ve tried it with whole wheat bread and it just wasn’t the same but the bread is very secondary in this recipe since it takes a backseat to the real star… Cheese! Sharp cheddar cheese is key for this cheese puff casserole. 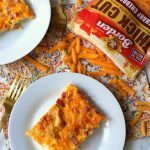 While a more mild cheese can be used, we always opt for sharp cheddar in our house because the recipe is called cheese puff casserole and we want to really taste that wonderful melted cheese flavor in every bite. 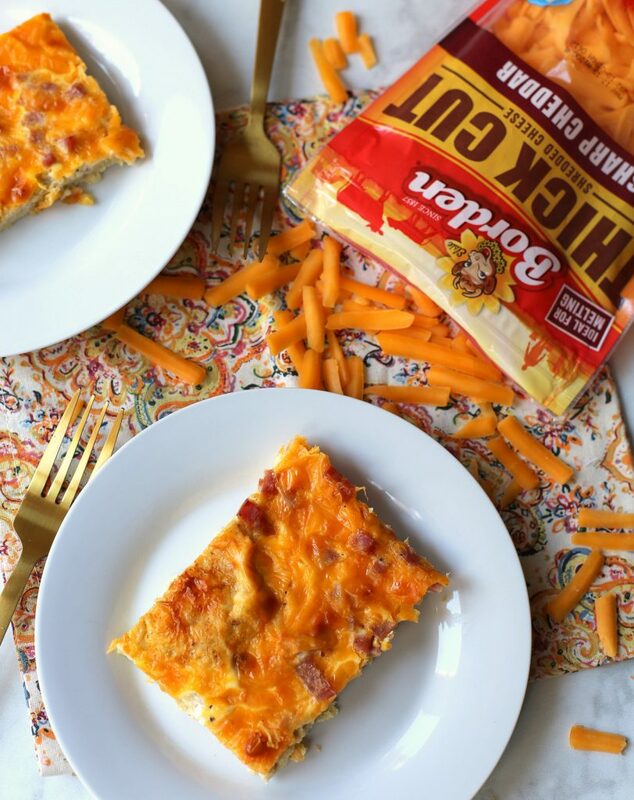 To share this recipe on the blog with you guys today, I made it with Borden® Cheese Sharp Cheddar Thick Cut Shreds and it was a slam dunk. The thicker cheese shreds cover more surface area and were perfect for melting, and helped give the casserole the creamy, sharp extra cheesy flavor we love. One huge perk that comes along with this recipe is the ability to prep it ahead of time. It’s a recipe that needs to sit overnight but that makes it ideal for big holiday gatherings since you won’t have to do anything the morning you want to eat it other than pop it into the oven for 45 minutes. And speaking from experience, smelling this casserole in the oven on Christmas morning makes the whole house feel extra cozy! A cheesy, savory dish perfect for a holiday breakfast or a family brunch. Evenly sprinkle cheese and ham on top of the slices of bread. Whisk the eggs and mix together with milk, Worcestershire sauce, salt, pepper and mustard. Pour the egg mixture over everything. Top with additional cheese if desired. Bake uncovered at 350 degrees for 45- 60 minutes or until casserole turns golden brown and begins to puff up. What is your go-to breakfast dish for family gatherings over the holidays? Every Christmas morning, I can guarantee you’ll see Cheese Puff Casserole and Monkey Bread on my family’s plate and an Orange Julius in our glass! Looks yummy, I love sharp cheddar! Hahaha! Oh gosh now that would be an interesting one! I actually debated renaming it bc it sounds kind of strange but had to go with the family name for the dish in the end! It puffs up a lot in the oven (hence the name) but quickly settles down as it cools. If you love sharp cheddar (and eggs! ), I think you’d enjoy it!! YES!!! I almost didn’t read the post because I thought ew??? Cheese puffs in a casserole??? HA!!! Hi Julie. Usually a stick of butter is 1/2 cup. Can you clarify if it’s 1/4 or a 1/2? I’d love to make this on Thanksgiving! Oh it’s just 1/4 cup! Just fixed the post!! When my mom wrote the recipe out on a recipe card for me for my bridal shower it said to make it with 1/2 cup/one full stick of butter and butter both sides of the bread but we started just buttering one side a few years ago and actually liked it better that way! I make something similar for Christmas morning- a cheese soufflé. Sounds fancy but it’s pretty much your recipe minus the ham and some of the seasoning! It’s also prep ahead which I love. I bet this would also make a fun breakfast for dinner recipe. Sounds great!! My mother in laws pineapple soufflé is the same way — sounds fancy but it’s SO simple (and delicious)!! And I LOVE the breakfast for dinner idea for this recipe!!! I don’t know why we haven’t done that before! Oh My God! I totally thought this involved cheese puffs… like Cheetos … and I was like, “This woman has lost her mind!” LOLOL. Glad I kept reading! I’ve been making your family’s stuffing and glazed carrots the past few Thanksgivings 🙂 two of my very favorite sides! Aw thanks for sharing this with me 💗 I am already dreaming about that stuffing! Hey Julie. I know this is NOT on this blog topic but are you still loving your doTERRA essential oil diffuser? I am considering getting it as a white elephant gift, I have read a lot of reviews on different diffusers and sounds like a lot stop working after a few months. Would you still recommend yours? Hi! Yes!! I still use and love my diffuser! If you’re on the fence, there are a lot of other really nice diffusers on Amazon that are less expensive and really pretty/neutral looking — there just weren’t as many options back when I got mine otherwise I might have opted for one that looks a little more clean and neutral over the purple. 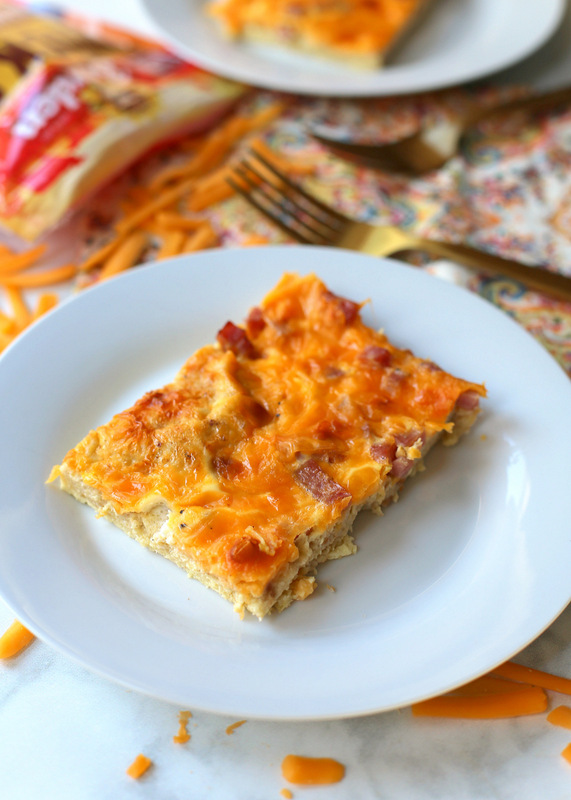 This is going to be one of my 2 breakfast casseroles this year! Looks easy and delicious! Thanks so much for sharing. Sounds delicious! Thanks so much for sharing it! Sounds like the perfect thing to feast on after we deliver meals Christmas day. Monkey bread almost always makes an appearance during the holidays at my house! You can guarantee there’s plenty of sweet potato casserole too with EXTRA pecan crumble topping! I also thought it had Cheetos or cheese puffs of some sort in there. Sounds so good and will be making it over the hoiday season! This looks so good! 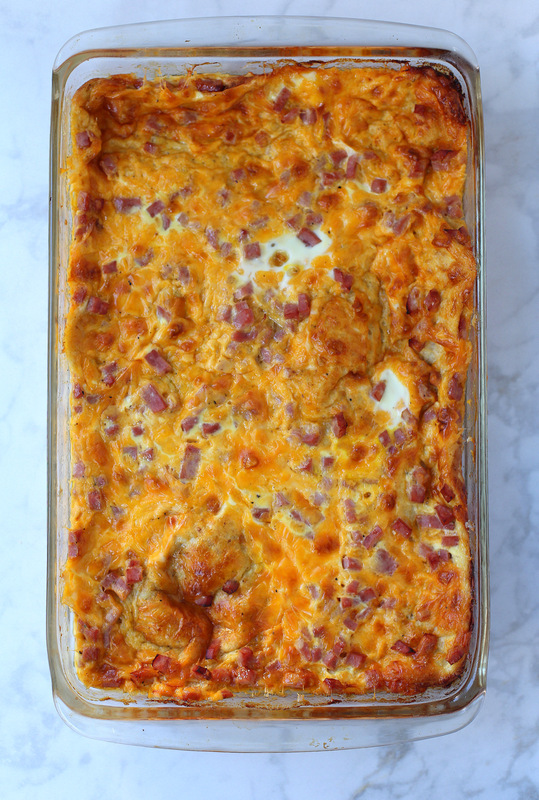 I love the idea of this casserole for Christmas morning breakfast. I usually make something sweet for Christmas morning but I have been wanting to switch it up and go savory this year. Thank you for such an easy breakfast casserole dish. Making for Thanksgiving this year! Hope you all love it!! Hi Julie! Quick question, do you think bacon could substitute the ham in this recipe? I make something like this but use crescent rolls for the crust. I’ve also added potatoes to make it a little healthier. My Nana used used to make something almost identical. We call it “Christmas Morning Eggs” in our family! So good!! Hi! Do you think I could make this ahead of time?